They're yellow, they're adorable and they want to play a game with you. Not so much an escape-the-room, this is a game for escaping into cute x 10, where the mood lifting chirp of a found chick is enough to brighten oodles of ho-hum weekdays. Just stroll onto the playground and join Yuri's Chick Hide and Seek 7 field day, where these downy puffs of personality are nestled into every possible hiding spot waiting to be discovered by you. The goal of the game is to find all ten chicks then "escape" the playground by finding the exit. 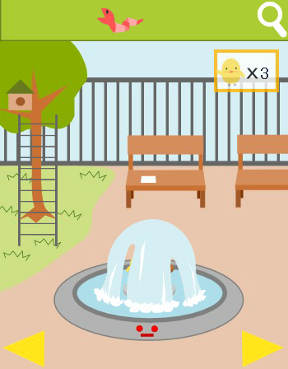 Play by searching each scene for useful items, hints and chicks, clicking anywhere a baby bird might be able to hide and solving a few puzzles to uncover those chicks too shy to be found in ordinary spots. Because it's more involved than the previous hide and seek, this installment feels more fleshed out and satisfying although it's still just as easy. The only challenge—as well as the biggest annoyance—comes from the lack of a changing cursor. The park setting is varied enough yet has few distinctive areas. Several spots don't immediately elicit an "Ooo! I should look more closely there" response. So, instead, you'll have to try clicking on many nooks and corners no matter how non-suspicious they may be, risking the disappointment of a fruitless click. That's a big drawback for those who abhor any level of pixel hunt. Still, such angst is mitigated by the sweet expression of adorableness on each tiny yellow peep. The fun of discovery, the general ease of gameplay and the rewarding cuteness provide all the reason needed to recommend Chick Hide and Seek 7 for your weekday escape. Chick Hide and Seek 7 Walkthrough now available! You begin facing a park bench flanked by two flower beds. Make a note of the pattern of red and white flowers on the left. Get CHICK 1/10 hiding by a yellow flower. Find CHICK 2/10 under the bench. Go left to a bridge over a small lily pond. Notice something about the fence in the background? Get the LADDER that's sideways against the fence. Quickly click to catch CHICK 3/10. Here is a door...but a key is needed. From the pond view, go left again to see some playground toys and a sandbox. Back out of the play structure, take the LADDER again. Get CHICK 5/10 when he falls out from behind the bounce horse. Here is a little sandcastle, but if anyone is inside, they're not coming out yet. Move left from the sandbox/play structure area. Here is a fountain, some benches and a birdhouse in the tree. Where do snakes usually slither around? Here are two round red buttons; you need click the round red buttons in the correct pattern then press the rectangular. When done correctly, the water turns off and you can get CHICK 8/10. Turn back to the lily pond and click underneath the bridge on the right side to find a door. Return to the sandbox and zoom in on the sand castle. Use the BUGLE to make CHICK 10/10 come out of the castle. Turn around until you see the chicks lined up along the fence (in the same scene as the pond and bridge). Click the middle of the bars and one will pop out. Go through the opening in the fence to escape! Congratulations! Have a cute, happy-filled day! Thanks, elle, for the walkthrough! Fun and cute. I needed the walkthrough for a few of them. If you click on the chicks at the end, they will wave for a while. I managed to get 5 chicks waving at once. Whee!